We created woodcuts. It was tricky using the woodcut knives for the first time ever. We had to show a lot of determination and never give up. We cut out our designs with the woodcut knives. It took a long time and a lot of concentration. There were also a couple of cut fingers. 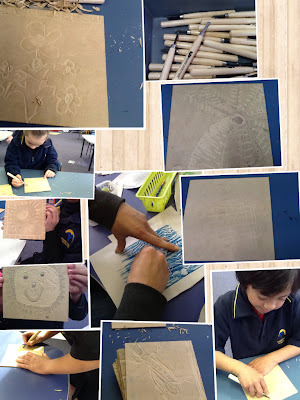 We are going to use our woodcuts to create prints. Henrietta created a Pic Collage to show different parts of our woodcutting experience. Thank you so much to all the parents that helped us create our woodcuts. We really really appreciate all your help. And then something "magical happened"
We did crayon rubbings and our designs appeared. Great wood cuts room 5! I like how you rubbed canyons when the woodcuts were under the paper. I loved helping with the woodcuts! You all showed great determination to complete your piece!